Hello, beautiful friends! Happy Monday! Before I jump into today’s post, I wanted to clue you in on an exciting adventure I’m embarking on today. I’ll share a recap on the blog later, but if you’d like to follow along make sure you’re following me on Instagram, Facebook, and Twitter. Ok, now onto business as usual. Today I’m sharing how I decorated my antique buffet that belonged to my late grandparents (read how I re-coated it here). This is the buffet’s first Christmas in our house so I wanted to make it special. Because we all know 1920s buffets have feelings and Christmas expectations. I went with a white and silver Christmas vignette this year. I’m in love with how it turned out. I think it looks especially good the mint lamps (from Home Goods). I didn’t intend to have a white and silver tree theme. It just kind of happened and I went with it. 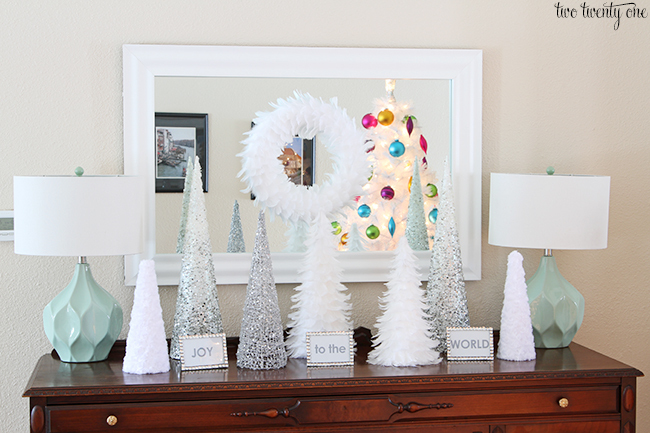 I bought the tall white and silver sequined trees 6 years ago at a day-after-Christmas sale. They lived in my parents’ basement until this summer when I spotted them and decided to bring them back to our house. I remember when I bought them, Brad told me they were ugly. Psh. 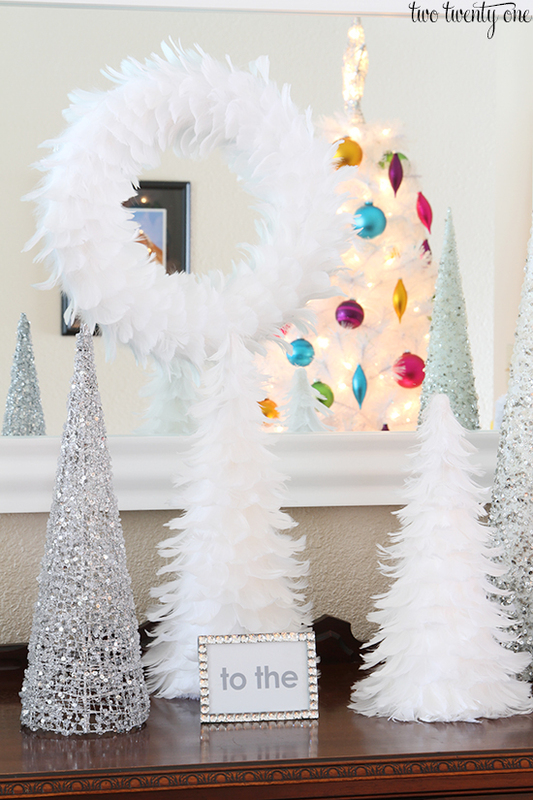 The feather wreath and trees were Target 50% off day-after-Christmas sale from last year. See, it definitely pays to hit up those December 26th sales, ladies. 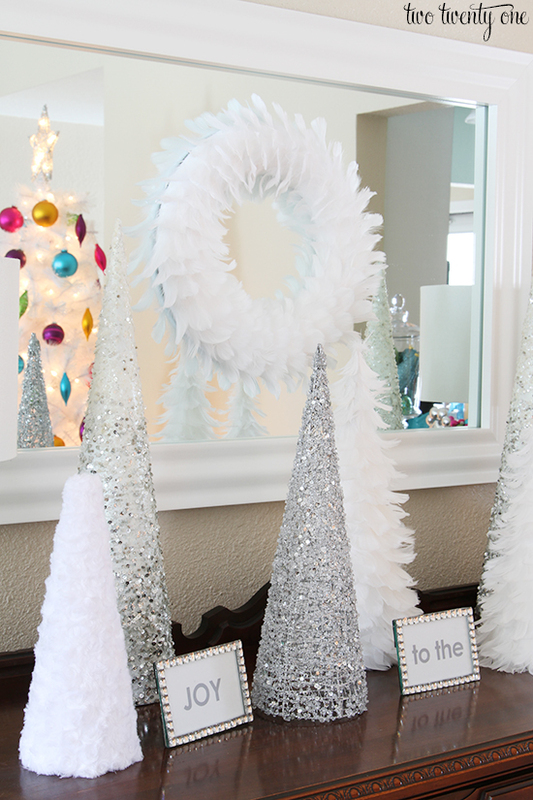 I picked up the all silver sequin and glitter tree at JoAnn Fabric this year for 50% off. 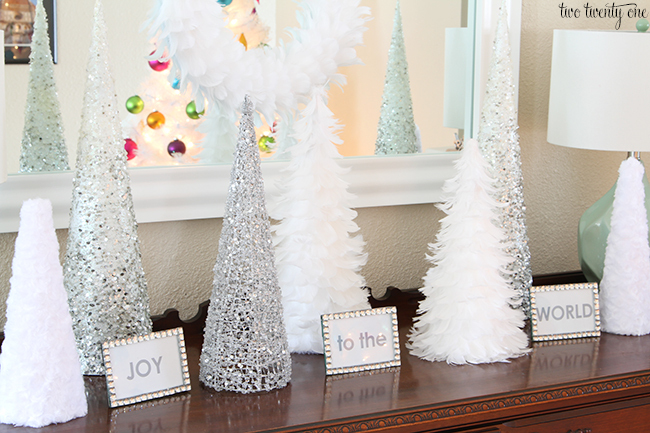 I made the fuzzy white trees to offset all the sparkliness. The frames came in a 4-pack. I used one of the frames for the wedding card box I made for my sister. The “Joy to the World” in the frames is nothing special– I just typed it out on my computer, hit print, cut out the paper, and slipped them into the frames. I like to think the neutral color scheme of the buffet offsets the colorfulness of our Christmas tree. 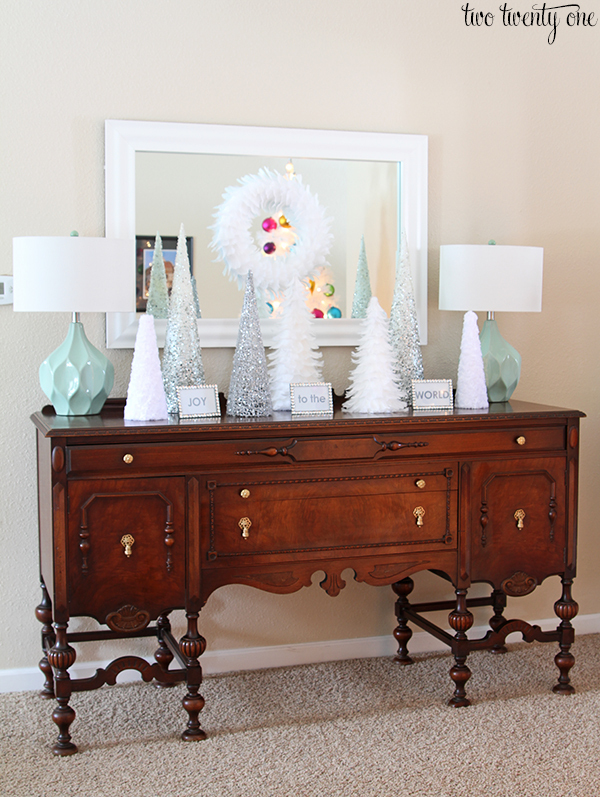 That’s a beautiful buffet–I especially love the color scheme of it all and the textured mint lamps! Lovely vignette! Those feather tree, did you make them? Gorgeous! Love the way it turned out. so pretty! it feels light and airy and glitzy too. love it. Sooooo beautiful! And those lamps are amazing! 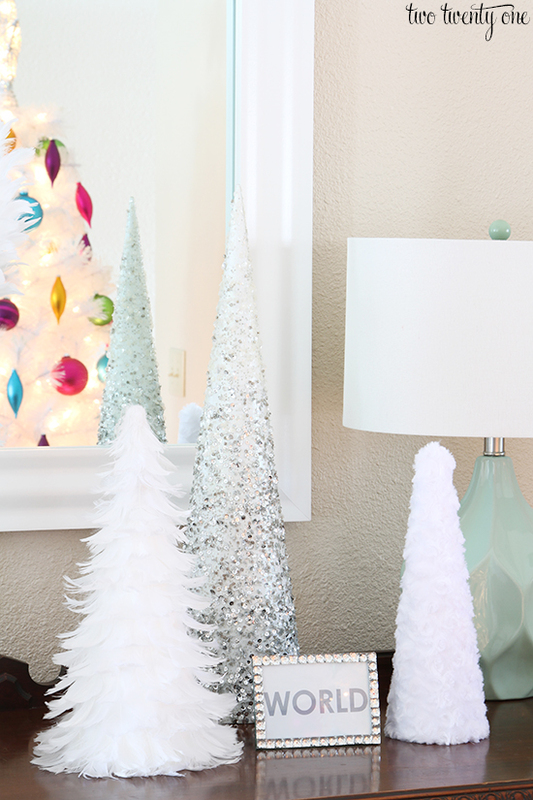 Love those lamps and I am all for the white and silver Christmas! So pretty! Love all the trees and the glitter together! 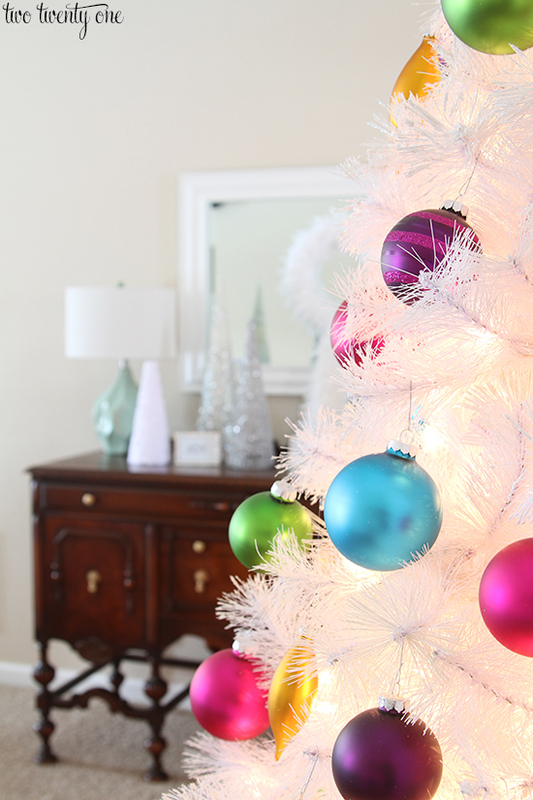 I love how crisp and bright this is with the pops of color! Seriously those are the best sales! !